Allow your Guests to Charge their devices, Play their favorite Music or even share their own video content on the Guest room screen…..
Zenros offer a wide range of MediaHubs all customized to meet the in room infrastructure as well as the clients need. The Glass Media Serie is designed to match the design of the GRMS panels. The design is fully customizable in colors and print in order to meet the atmosphere of the Guest room. Flush-mounted adapter Glass plate combines multiple socket options with an all-in-one multimedia connectivity station for the hotel room. MediaHub-module plus Power-modules offers all the audio/video inputs your guests need to enjoy from their own content from ANY media playing device through the in-room TV while providing conveniently located power outlets to keep mobile devices charged up. Introducing the new feature rich wireless Mini MediaPanel which provide guests the option of auto connectivity for their portable devices. The Mini MediaPanel is designed to match the design of the GRMS panels. The design is fully customizable in colors and print in order to meet the atmosphere of the Guest room. Flush-mounted adapter MediaPanel combines multiple socket options with an all-in-one multimedia connectivity station for the hotel room. The MediaPanel offers all the audio/video inputs your guests need to enjoy from their own content from ANY media playing device through the in-room TV while providing conveniently located USB-power outlets to keep mobile devices charged up. The Multi-Function serie includes single unit Hubs with all media and powers sockets build in to the product. The flush-mounted MediaHub offers all the advantages merged into one single unit. 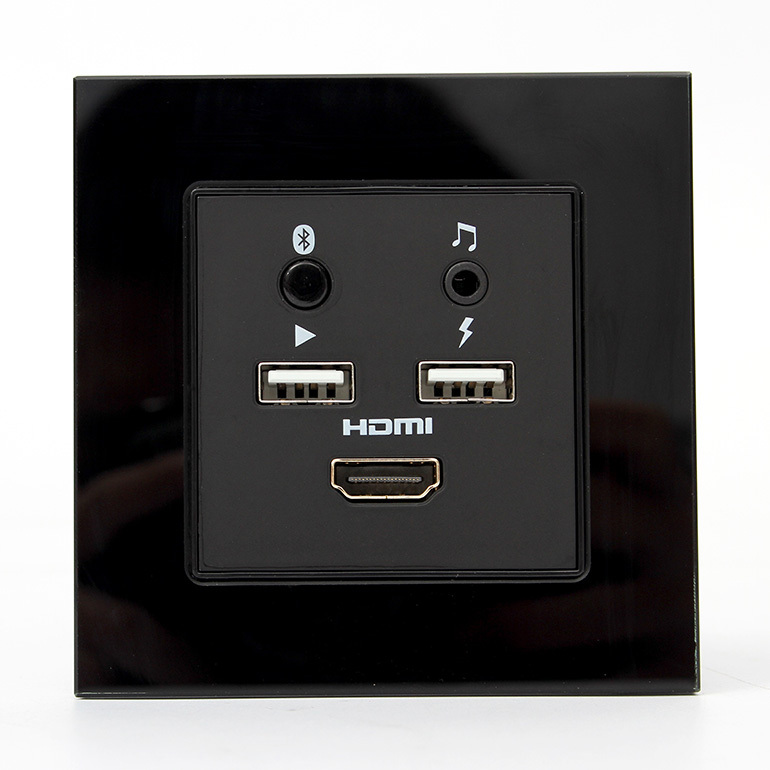 The MediaHub is powered be a single corded power cable like all media features are enabled from a single HDMI connection on the back. Guests can enjoy their own movies, videos, music, games, photos, and even business presentations through the in-room TV while charging all of their portable electronics through the two power- and USB outlets.